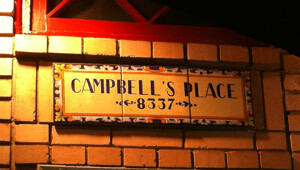 Campbell’s Place is an “Old World” tavern styled after an English pub. A lively unpretentious atmosphere serving affordable New American fare along with an extensive selection of fine draught beers and wines. Dine in a cozy booth, at the 100 year old bar, or at the “V” bar and upstairs dining room. A neighborhood gathering spot, “Chestnut Hill’s Cheers” is located on Germantown Avenue just below Gravers Lane.